In 1793, Nicolas de Condorcet, a French Revolutionary and Enlightenment author, wrote the remarkable book “Sketch for a Historical Picture of the Progress of the Human Mind.” Within it, he outlines the cultural and intellectual growth of the human race from beings no different from animals, to slaves of religious leaders, to the post-revolutionary France and America based on science and rationality. While his history of human growth through the lens of a rational scientific mind is remarkably insightful, it is actually the final chapter, where he takes the then-unique step of projecting human progress into the distant future that makes the book stand out from its contemporaries. Condorcet’s exceptional vision is of a human race with unlimited potential through universal education, a civilization of beings with the power of gods through science, and a culture of peace and equality through rationality. He wrote these wonderfully optimistic predictions while awaiting execution at the hands of his political enemies. “Progress of the Human Mind” is a short but dense book. The English translation is not an easy text, but the tenacious reader will find themselves rewarded with Condorcet’s many insights about human history, where our ancestors progressed–and why they often did not. When he chronicles the Greek ideological battles between sages and philosophers, he observes how they occasionally showed scientific promise, but lacked the empirical method necessary to discern which ideas were true. In describing the rise of Christianity and the resultant Dark Age that followed, he notes the religion’s reliance on revealed knowledge to explain its “contempt for human sciences,” which threatened its power with observable truth. If only the printing press had been invented before Christianity came to power, Condorcet laments, the sciences may have held their ground and the millennium of stunted human progress might have been averted. Condorcet observes how a mind like Isaac Newton’s is a rare and brilliant thing, but once Newton is published, everyone can read his work, making Newton’s genius a commonplace phenomenon among school children. Imagine a world, Condorcet tells us, where public school systems turn all children into Newtons. There is no end to knowledge and “all the possible combinations of ideas” cannot be exhausted, meaning our potential as human beings cannot be exhausted, “that no bounds have been fixed to the improvement of the human faculties; that the perfectibility of man is absolutely indefinite; that the progress of this perfectibility, henceforth above the control of every power that would impede it, has no other limit than the duration of the globe upon which nature has placed us.” Human progress is limitless through education. Condorcet even goes so far as to claim that human beings may attain indefinitely-extended lifespans through science, observing progress in the medical sciences, he writes, “Would it even be absurd to suppose this quality of melioration in the human species as susceptible of an indefinite advancement… and that the duration of the middle space, of the interval between the birth of man and this decay, will itself have no assignable limit?” In 1964, Richard Feynman observed that this is not an entirely crazy idea, “…there is nothing in biology yet found that indicates the inevitability of death. This suggests to me that it is not at all inevitable, and that it is only a matter of time before the biologists discover what it is that is causing us the trouble and that that terrible universal disease or temporariness of the human’s body will be cured.” Our life expectancies at birth have grown by nearly 40 years since Condorcet’s time, and the emerging Genetics Revolution promises to take our children and children’s children even further. 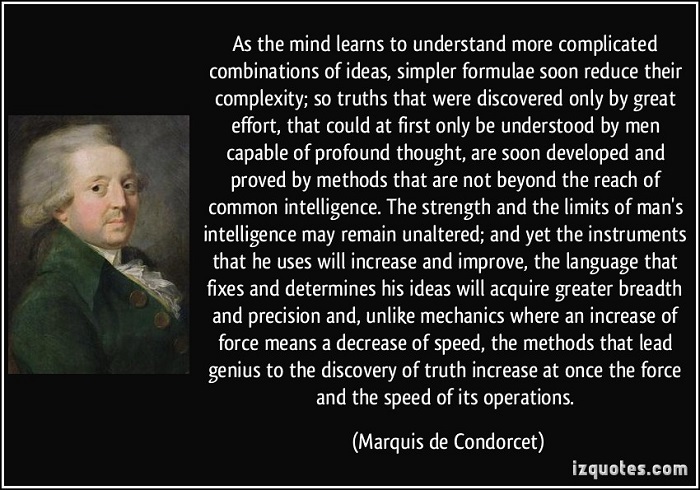 “Progress of the Human Mind” was published in 1795, a year after Condorcet was found dead in his jail cell. This followed a year of living in hiding after being branded a traitor for his opposition to parts of the French Constitution. Some historians believe he was murdered because he was too loved and respected for execution. How did his writing stay so optimistic under such dire and unjust circumstances? And how admirably calculated is this view of the human race, emancipated from its chains, released alike from the dominion of chance, as well as from that of the enemies of its progress, and advancing with a firm and indeviate step in the paths of truth, to console the philosopher lamenting the errors, the flagrant acts of injustice, the crimes with which the earth is still polluted? It is the contemplation of this prospect that rewards him for all his efforts to assist the progress of reason and the establishment of liberty. He dares to regard these efforts as a part of the eternal chain of the destiny of mankind; and in this persuasion he finds the true delight of virtue, the pleasure of having performed a durable service, which no vicissitude will ever destroy in a fatal operation calculated to restore the reign of prejudice and slavery. This sentiment is the asylum into which he retires, and to which the memory of his perfecutors cannot follow him: he unites himself in imagination with man restored to his rights, delivered from oppression, and proceeding with rapid strides in the path of happiness; he forgets his own misfortunes while his thoughts are thus employed; he lives no longer to adversity, calumny and malice, but becomes the associate of these wiser and more fortunate beings whose enviable condition he so earnestly contributed to produce. “Progress of the Human Mind” is in the public domain. Free English translations are available at the Online Library of Liberty.